As a business, you should have already established your brand and defined your voice and personality outside of social media. Having a clear brand identity that informs all your messaging is part of both traditional marketing and online marketing. With social media engagement, a distinct character and an intrinsic understanding of the qualities of your brand guide the way you present yourself online. If you represent a brand, clearly specify the “personality” you use online. In most instances, companies use a brand personality that expresses a unified voice. Everyone on a company’s social media team adopts that same identity for consistency. In some cases, however, allowing individual team members to be identified or to stand out is part of an overarching strategy to convey the brand’s image. A messaging map that’s thoughtfully developed and clearly organized encourages conversations between your brand and your audience while acting as the North Star to keep your messaging on track. Rather than rehash PR messages, look for ways to be conversational, share valuable information, tell stories, and inspire followers to respond because what you’re saying in social networks is relevant to them. You can include marketing messages, but serve up more than commercials. Describe your target market, audience, and tribe. Specify who you’re trying to reach. Break out the segments of your target audience. Social networks have multilayered audiences. If they’re relevant to you, be sure to address them or at least acknowledge them. Vendors, the media, and other stakeholders are all separate categories, for example. Get granular, by spelling out the demographics and psychographics of your core audiences. Identify the key interests of people in your market segments — the topics that resonate with them. Taking a closer look at your target market is the first step in developing your social media messaging map. Avoid making biased assumptions about your audience. You’re not trying to stereotype as you develop your social media messaging map. Instead, flesh out your version of the ideal customer. Circle back to your goals. Knowing and serving the audience is useful, but staying close to your goals is also important as you craft messages. Suppose that you’re a personal chef targeting moms in their 40s. You want customers to hire you to prepare healthy, custom meals for themselves and their families. You also want satisfied customers to encourage their friends to hire you. Establish what types of posts to use. You can develop many types of messages based on the audience and on your goals. A mix of the following elements maintains fresh and relevant content: Announcements, Events, News, Special offers, Inspiration, and How to. Come up with specific topic themes for messages that serve both your audience and your goals. Craft sample messages geared toward each audience and goal. The content that results forms a grid specifying who you’re trying to reach and the types of messaging you’ll develop and post to reach them. Detail themes and topics that you’ll incorporate each week in order to show consistency. When you’re consistent, your audience knows what to expect and becomes more inclined to participate. In fact, they’ll look forward to upcoming content. The sample messaging should indicate tone and voice, down to specific wording. Tie your messaging to your goals. Flexibility (rather than rigidity) is important, and being responsive to conversations in real-time is critical. Just don’t lose your overall focus. 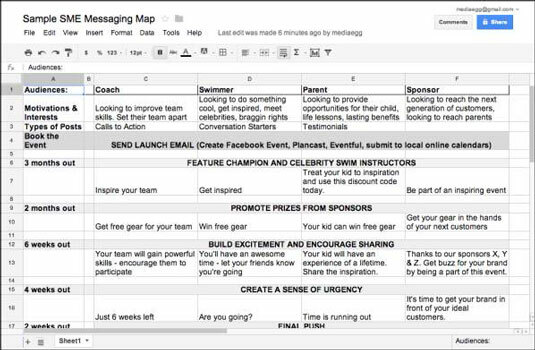 A messaging map helps you build out a framework for an editorial calendar that includes specific types of messages — and the messages themselves. This calendar is the foundation of (and your guide to) communicating in your social networks. Embracing the core themes of your social media messaging map gives you the perfect place to start when crafting the messages you share every day or week. Listening plays a major role in your daily engagement activities as well. Find a balance between marketing messages, responses, outreach, and interactions.